By Cece Bell. 248 pp. Amulet Books. $10.95. (For Middle Grade-Schoolers) Release date: September 2, 2014. When Cece starts first grade in the 1970s, she not only faces meeting new kids in a new school in a new town, but she has a bulky “brand-new superpowerful, just-for-school hearing aid: The Phonic Ear” strapped to her chest. She’s scared. Well, who wouldn’t be? In this graphic novel memoir–a comic if you will–we enter the grade-school experience of children’s book author and illustrator Cece Bell, who lost her hearing during a bout of meningitis at age four. Before her family moved from the city to a smaller town, Cece attended a kindergarten where she was taught lip-reading but not American Sign Language. 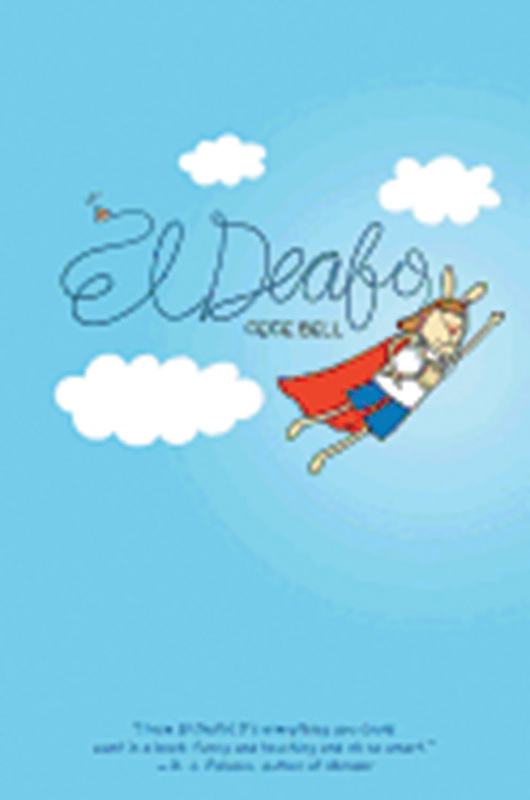 El Deafo tells the story of Cece’s years in a mainstream grade school. Along the way we learn a great deal about growing up deaf in a hearing world–the misheard words, the challenges of lip reading, the frustration of watching TV with no closed captioning, what it feels like to wear hearing aids, and much more. But it’s the universal questions of childhood (and certainly of adulthood, too) that make this a real story about a real kid–Who am I? How do I fit in? Are you truly my friend? Cece finds her answers. And we are privileged to be able to watch her.